Force of Olympic medals, America's Cups and Volvo Ocean Races among the all-star crew aboard Sir Keith Mills' TP52 5°West prevailed on day two of the RORC Easter Challenge. The fastest boat in the fleet, being steered by the TeamOrigin boss and creator of Air Miles, has taken the lead on handicap in IRC One, after today's three races on the central Solent. One race around the cans, was followed by two windward-leewards, held in continued challenging conditions, spring tides and a freezing Arctic breeze from the northeast. 5°West now leads IRC One, three points ahead of Andrew Pearce's Magnum II, first of the trio of Ker 40s competing. Yesterday's leader, Simon Henning's Alice II, was over early in the opening race and followed this with a disappointing day dropping her to fourth overall, albeit tied on points with their Farr 45 sistership Kolga, crewed by the British Keelboat Academy crew. Owned by former Skype co-founder Niklas Zennström, Kolga is this year being skippered by 20-year-old James French and at the RORC Easter Challenge this year she is the only entry crewed solely by British Keelboat Academy trainees, although BKA sailors are to be found on numerous other boats across the fleet. Like Alice II, Kolga suffered an OCS today, but in the second race. "It was super shifty and we got up to the mainland shore and it was snakes and ladders, but that makes the race pretty interesting," recounted French. "It's great racing this weekend between the three 45s, the team is gelling nicely and we are getting some good results. The Ker 40s are the same pace as us, so we are always racing someone." French, who calls tactics confirmed it was a tough day with the tide turning around lunchtime, right in the middle of racing and while the wind built to 15 knots in the first race, in the second many of the boats were caught out with headsails that were too small as the breeze dropped to five knots off the mainland shore. South African Mike Bartholomew and his King 40 Tokoloshe had another solid day, scoring a 1-2-1 in IRC Two, where she is now easing away from RORC Vice Commodore, Anthony O'Leary and his Irish crew on second placed Antix. IRC Two is popular with officers of the RORC. Admiral of the Club, Andrew McIrvine, and his First 40 La Réponse, are lying sixth in the 12-strong class. "It is very close boat for boat racing despite the big range of handicaps," said McIrvine, adding of today's racing: "There was loads of current. In every race the boats on the left found the lifts and bands of pressure. It was the old rule of 'if it's from the north, go north': If you stayed on the left of the fleet, you gained." 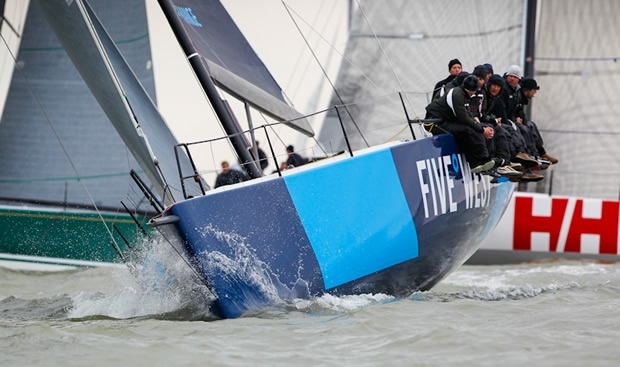 McIrvine, who was particularly proud of his successful port tack start in race three, added his crew was also improving in what is their first UK regatta of 2013. "Yesterday was a bit sloppy, but the boat handling today - we did some very good manoeuvres, last minute take downs and gybes in the middle and everything worked beautifully." David Franks' JPK 1010 Strait Dealer looks set to repeat her perfect score line from 2012, winning all five races held so far. Gunning hard for her is Peter Morton's crew on the second-placed Corby 33 Salvo, but this is proving hard. "They are sailing very well. They are spotting shifts and putting the boat in the right place all the time. We are marginally quicker upwind, but on each run they come through us again," said Morton, adding that the competition on the water is superb with very tight finishes in every race. Trying for a similar record to Strait Dealer is Peter Schofield's team on the Lymington-based HOD35, Zarafa. Unfortunately her perfect scoreline was blemished when she finished third equal in today's second race, won by Neil Cash and Nick Haigh's Fist 34.7 Alutra & Steamy. "Talk about up and down - it was very challenging and difficult," said Schofield, who admitted that the racing this Easter weekend is some of the coldest he can remember. "We were wearing so many clothes we could barely move." Schofield is a big advocate of the coaching aspect of the RORC Easter Challenge. "The format is great. I find it staggering that people don't make more use of coaches sailing. You wouldn't have a cricket team or a rugby team, even a village team, without some coaching." But perhaps most grateful for the on the water and post race tuition provided by the guru Jim Saltonstall and his team are the crews from the three Gosport-based Royal Engineers Yacht Club boats. Today a coach came on board their Elan 31 Ragna of Upnor for the second race. Skipper of Ragna of Upnor is Lucy Allaway and her crew is all-female, save one. Allaway serves with the Adjutant General's Corps and is attempting to form the army's first all-female sailing team. "This is a great weekend because the amount of benefit we get back from the coaching is fantastic and the debriefs are brilliant. Particularly when you bring a crew which doesn't usually sail together, it is great to have that professional feedback." Two races are scheduled tomorrow, the final day of the RORC Easter Challenge, with the first start due at 11.00.